Do you understand the difference between gold bullion coins and numismatic coins? There is a big difference between these two, and their investment and trading value. When you buy and sell gold bullion coins the value of the coin will depend on the amount of yellow precious metal that is actually in the coin not its appearance, year of mintage and level of historical significance. All these factors are irrelevant for bullion products. This is not the case with numismatic coins, which are valued because of historical value or age and rarity instead on top of the metal content. Dealing with numismatics requires very specific set of skills and knowledge that not all of us possess. If you are a rookie in this field, you are risking overpaying for a worthless piece. 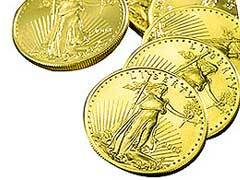 American Eagle gold coins are a gold investment that can be either type of coin. Newer ones are valued based on their precious metal content, but older ones are valued because of their rarity and age. This form may be more expensive than if you buy gold bullion bars, but if you want an investment that you can hold and carry the extra cost may be worth it. Gold bullion coins prices can be fluctuating, depending on the current price of gold. Bullion strikes come in many different varieties, with a range of countries issuing them. Canada offers the Maple Leaf coins, which are high quality investment grade gold and a terrific investment, just like gold bullion coins for sale offered by America. You can find both types of coins from many different countries around the world, and you can profit from numismatic coins in some cases just like you can with ones that are bullion based. There are many ways to acquire precious metals bullion, depending on why you are investing and what you hope to gain. If you decide on them for your investment capital, then you need to evaluate whether you want numismatic or bullion ones. Most investors consider the bullion coins a better option, but if you want to hold a piece of history then you may want a few numismatic choices as well. Coins are easy to store and keep secure, making them a great choice. So there you have it: numismatics are strictly for collectors, bullions are for investors! However, there are always individuals who have a little bit of both in them. Who do you what to be?